Hulmes Bridge Ferry is a place on the waterways minor waterways place place on the waterways major waterways place village town city on the Manchester Ship Canal (Main Line) between Walton Junction (Junction of Manchester Ship Canal Main Line and Walton Lock Branch) (9 miles and 5 furlongs and 2 locks to the west) and Pomona Dock No 4 (Junction with Branch to Bridgewater Canal) (6 miles and 6¼ furlongs and 2 locks to the east). 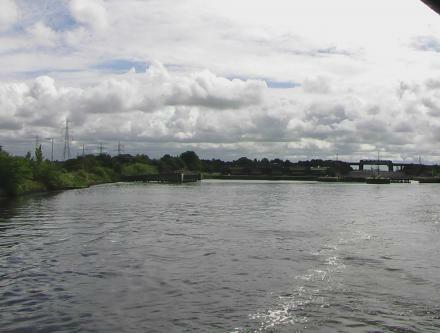 The nearest place in the direction of Walton Junction is Irlam Locks; 1½ furlongs away. The nearest place in the direction of Pomona Dock No 4 is Barton Locks Jettys; 1 mile and 5 furlongs away. Hulme&apos;s Bridge Ferry is open from May to November, Thursday to Monday from around Noon to 5pm up to September; then Noon to about 3pm there after.\\It would need an act of Parliament to close it as the ferry replaced the sort of bridge that was there, and an agreement was made to supply the ferry when the bridge became obsolete. Information last edited Friday the 19th of January, 2018 at 3:06 PM by Shultzy. Ferry Rd, Manchester, M44 6DN — 183 yards to the west. Within 'A Cut Above Nails & Beauty' 114a Woodsend Road,Urmston, Manchester, M41 8QZ — 1453 yards to the northeast. Irlam, Manchester — 1329 yards to the southwest. The Greenhouse Media City UK 111 Broadway, Manchester, M50 2EQ — 262 yards to the northwest. 557 Liverpool Road Irlam, Manchester, M44 6ZT — 1593 yards to the southwest. Unit 3 & 4 Tallow Way, Manchester, M44 6RJ — 1110 yards to the southwest. Manchester — 1241 yards to the north. Irlam, Manchester, M44 — 1352 yards to the southwest. 617-619 Liverpool Rd, Manchester, M44 5BE — 864 yards to the west. 524-526 Liverpool Rd, Irlam, M44 6AJ — 1526 yards to the southwest. Irlam — 1329 yards to the southwest. Patting Close, Manchester, M44 6TL — 794 yards to the north. clover drive, Manchester, M71RF — 1467 yards to the northwest. Irlam — 1202 yards to the north. Urmston — 1385 yards to the east. Manchester — 1448 yards to the east. Irlam, Manchester, M44 6ZJ — 1352 yards to the southwest. Irlam, Salford, M44 — 209 yards to the northwest. Silver Street, Manchester, M44 6 — 1463 yards to the north. Valley Road, Manchester, M41 8 — 1343 yards to the northeast. Liverpool Road, Irlam, M44 6BR — 984 yards to the west. Manchester — 1329 yards to the southwest. 26 Roedean Gardens, Manchester, M41 6WL — 845 yards to the northeast. Based in Irlam, Manchester — 1352 yards to the southwest. Irlam — 885 yards to the northwest. Irlam — 1588 yards to the south. Winsford, CW7 — 1372 yards to the north. 18-20 The Village, Manchester — 1401 yards to the northeast. Irlam — 1414 yards to the southwest. Unit 10, Irlam, M445AZ — 1329 yards to the southwest. Neville drive, Irlam, M44 — 1480 yards to the north. Urmston — 1591 yards to the northeast. Manchester — 1563 yards to the southwest. Wythenshawe Park Wythenshawe Road, Manchester, M22 0AB — 378 yards to the east. Manchester — 122 yards to the northeast. Irlam — 1350 yards to the southwest. Merwell road, Flixton, Manchester, M41 6PR — 1392 yards to the east. Cutnook Lane, Manchester, M44 6JS — 897 yards to the northwest. Manchester — 1461 yards to the northeast. Irlam Wharf Road, Manchester, M44 5PN — 1533 yards to the south. 19 Goldsworthy Rd, Manchester, M41 8TY — 1578 yards to the east.